Announcing the arrival of Godgoat. No, godgoat is not a heavy metal band or a trendy cult. 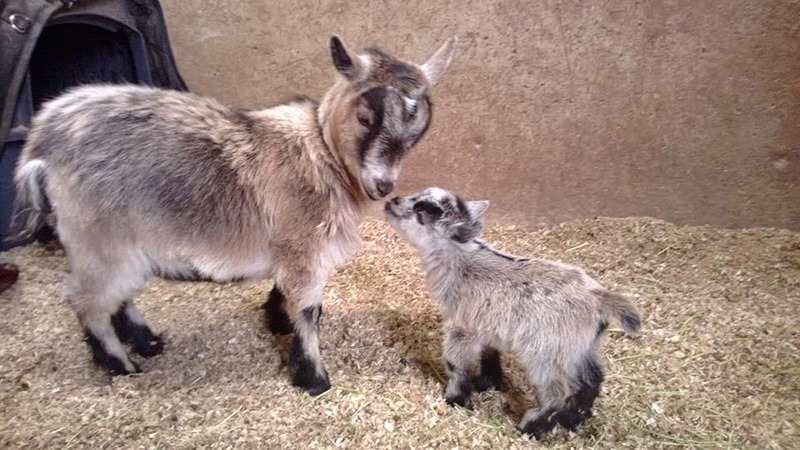 Godgoat is a teeny tiny pygmy baby goat, pictured here on the right. Nanny is his adoring mother, pictured here on the left. They live in Salt Lake City, the home of my birth. I am his fairy godmother, thus he is my godgoat. I am thinking about moving back to Salt Lake so I can properly guide his moral and spiritual development. Just kidding. Everyone knows I am moving to the Canary Islands, where by the way there are at times more goats than people. Do you sense a cloven hoofed theme? Cloven Hoof is actually a heavy metal band. You can Google it if you don't believe me. I digress. My point is: do you see the unconditional love between Nanny and Chico El Rey? I am not sure what the parents are calling godgoat, but I, his fairy godmother, call him Chico El Rey. From the moment I first saw him, I loved him deeply and all-pervasively. This is the power of the heart. Nanny feels it too. Speaking of cults, I am going to make t-shirts that say "I [heart] Chico El Rey". In time it will become a cult classic to own one of these shirts. People will dig around at yard sales and the Goodwill hoping and praying they find one. And why? Because everyone longs for the unconditional love which Chico El Rey represents. Everyone longs to merge with their true nature, the matrix of the universe, which is love. The problem is we are always forgetting. So we need t-shirts with pictures of small goats to remind us. One of my teachers recently said "Love is the guru". This statement might make us feel a little uncomfortable. It sounds like something an unreliable hippie might say while staring at the sky and picking dandelions for a head wreath. Guru means wisdom guide. Love means love. We can let it be our guide, let it be our compass, our GPS, our mission in life. I will also make a t-shirt for this. Or maybe those free pens you get at banks. Everyone will want to find a "Love is the guru" pen. It will have a phone number printed on it which you can call and hear an interesting quote or maybe a website where you can watch the Chico El Rey cam. My point is: we are always forgetting that which is fundamental and more true than truth itself. We are miracles living in a miraculous universe. In Buddhism we have some tools to keep reminding us of this bigger picture. They are called "The Four Reminders". And I urge everyone to incorporate them into their daily practice. 1. I have a precious human life with all the riches and freedoms needed for practice. I can use my life to help others. 2. Everything compounded is impermanent, even this very life. Death can come at anytime unannounced. I will not waste this opportunity called "my life". 3. The laws of karma are infallible. Every action has a consequence. I will be more mindful of my motivation and behavior. 4. The defects of samsara are innumerable. Therefore, I will focus on liberating myself and all beings from cyclic existence brought on by ego-clinging. Aren't these useful thoughts? Even if you are not Buddhist, I think you can benefit, no? And if nothing else, we could all just wake up and recite the mantra "I heart Chico El Rey". After all, waking up is the most important point.